Our Olive Tree of Istanbul tour is run in partnership with Small Projects Istanbul, a local NGO that’s helping Syrian refugees to find their feet in a new home. Here’s what one traveller discovered on the tour. For travellers, to roam and be immersed in new cultures and landscapes is the stuff of dreams. For others, it’s the stuff of nightmares. For some, travel to a new land comes with a heavy heart. It is a one-way ticket with no more than a suitcase — if that. Turkey is one of the many havens for people fleeing war-torn Syria. According to the UN, Turkey is the largest host country, with over 2.5 million seeking refuge. To aid one of the biggest humanitarian crises of our time, many centres throughout the country have opened their doors to help displaced Syrians rebuild their lives, especially in densely populated Istanbul. On The Olive Tree of Istanbul tour, it was time for me to get off the tourist trail and into the heart of Istanbul suburbia. We passed by colourful fresh produce stalls along narrow streets until we reached The Olive Tree Community Centre in the Capa District. There, we’d meet with several displaced Syrians who have escaped the unimaginable horrors occurring in their homeland. Citizens are dying and people are trying to escape by all means — and many without a final destination or future plan in mind. Small Projects Istanbul (SPI) is a not-for-profit foundation helping these people to rebuild their lives in Turkey. The grassroots organisation was established to help fill the void between the Turkish government’s response to the humanitarian crisis and the current state of facilities and services available to assist these individuals. SPI recognises the need for supplemental education for both children and women, to give them a chance to secure a livelihood in Turkey. In the last year, the centre had to move due to the increased number of people participating in the project. The trade-off for finding a bigger space was that it moved to a basement residence with no natural light. But despite the bleakness of natural rays, down below the natural human light shines. The centre itself is just a few rooms — a kitchen, a crèche, an eating area, and an office. 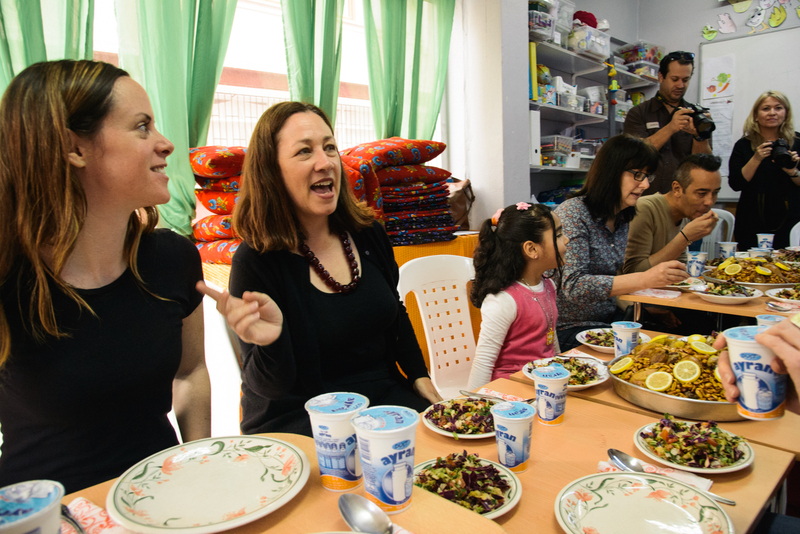 It is nothing glamorous and rather basic, but immediately as I stepped foot into the centre, I felt nothing but warmth from its international volunteers, from the Syrians themselves, and from the aromas wafting from the kitchen. To support SPI’s operational costs, the centre has opened its doors for visitors to Istanbul wanting to give back to local communities. Travellers are invited in for dinners and meet-and-greets, and can learn first-hand about something that a majority of the world only hears about through the media. Along with other tour participants, we were all welcomed to the centre as the final touches were added to our home cooked Syrian meal. It looked as if it was festive affair with the amount of food that was freshly prepared and presented to us by the Syrian women who attend the centre’s programs. We were introduced to the nourishing flavours of Syrian cuisine, with dishes including moujadara (burgal, green lentils, and fried onion), maklube (spiced rice, chicken, and nuts), baba ganoush (eggplant mixed with olive oil, tahini, and spices), and fetteh (rice, crispy bread, chicken, and tahini). The night would fill my stomach with food and my mind with much to think about. The intimate dinner was joined by a few Syrians and volunteers of SPI and other tour participants, and we heard first-hand experiences of what had been encountered by in war-torn Syria. There weren’t any dramatic announcements made about these difficult tales, but they found their way into conversation. As the night progressed, people opened up about their previous lives in Syria, their journeys to get to Turkey, and how the centre has aided them to start new lives in Istanbul. There are many volunteers that enable SPI to operate the two programs it runs at The Olive Tree Community Centre. There is an after-school program to teach primary school-age children the Turkish language, as well as lessons for adults adjusting to a new life in Turkey. But the program is not limited to just learning a new language, as SPI thrives on educating women to become self-sustaining business managers. Through the craft collective initiative, aptly named ‘Drop Earrings Not Bombs,’ Syrian newcomers are taught how to make uniquely designed earrings using threading and wire. These earrings are then sold online as well as locally. This project was created to help enable these women to utilise their skills while (unfortunately) their lives sit in limbo due to lengthy immigration processes. As we wiped the corners of our lips and bid our farewells after dinner, I knew my outlook on the conflict — and the people affected by it — would never be the same. A visit to the centre offered me a chance to come to grips with the true realities of war. But as bleak as that may sound, the experience was from far from it. The centre is full of optimism and one thing is for sure: it will certainly make you reassess how you can leave your mark in the world and help map the road ahead for others. And that would be the best reality anyone could ever dream of.